1. In a bowl, whisk together the stock, soy and eggs until well combined. Place the flour in a separate bowl, make a well in the centre and pour in the stock mixture. Whisk to a smooth batter, then stir in the ginger, salad onions, cabbage and carrot. 2. Heat half of the oil in a small (about 21cm) frying pan. Spoon in half of the mixture and cook over a medium heat until a crust starts to form around the edges and the underneath is golden and set. 3. Use a spatula to flip the pancake over and cook for 3 minutes more until set. Tip out onto a chopping board and repeat with the remaining mixture. 4. Mix together the mayonnaise and wasabi and spoon into a small bowl. 5. 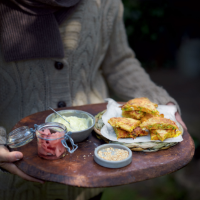 Cut each pancake into wedges and serve with the wasabi mayonnaise, toasted sesame seeds and pickled ginger alongside. This recipe was first published in Mon Aug 24 16:09:00 BST 2015.